It’s been a rainy week up here in my small town. Even our biggest summer festival was rained out this morning. I, meanwhile, have had a craft success: a homemade anti-static powder bag and a lifetime supply of refills. Anti-static tools are pretty widely available and are used to dry and remove static off a paper’s surface before heat embossing. Basically, the tool helps make sure your embossing powder only clings to your ink and to no other residues that may be on the paper (sticky fingers, etc.). I’ve been having trouble with heat embossing recently. I think it’s because of the humidity in the air that makes the embossing powder stick all over my paper. The final results looked messy. A quick ‘Google’ and I found out that the powder inside the commercially available tools is sometimes cornstarch. I also remember videos where people mention their anti-static bags smelled like baby powder. The total cost of my homemade supplies was about $5 but I’m pretty sure I now have a lifetime supply of powder tools. I made a small bag using a piece of fabric that was about 6X4″ and folded in half. 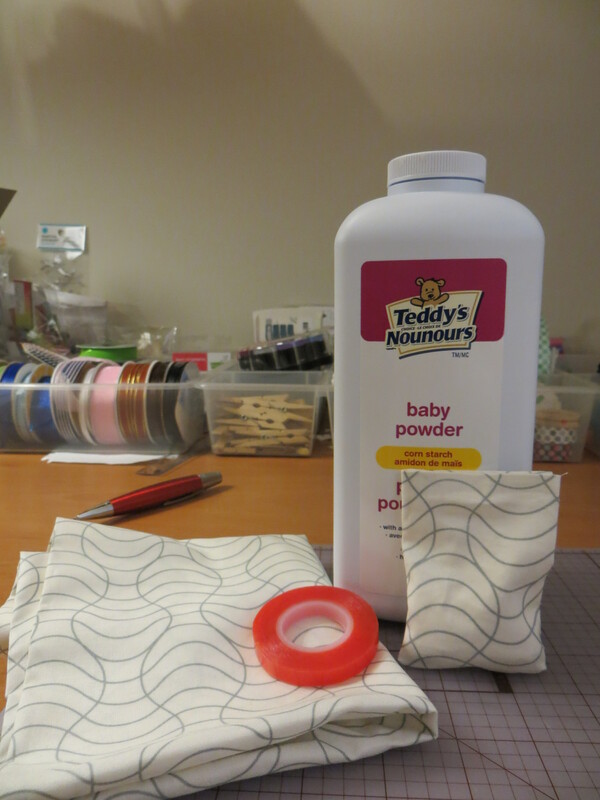 I adhered the seams together using permanent double sided tape and then turned the bag right-side-out to fill it with the corn starch baby powder. I sealed the top, again with permanent double sided tape. The whole project took less than five minutes. Woot! Success! There is now a video to show you exactly how I made my anti-static power tool. You can watch it below, or over on my YouTube channel.